Hibiscus is one of those amazing things that delights with not only its taste, but also its color and fragrance. We get to celebrate two of those three things in our hibiscus cake recipe, otherwise known to us as the Magical Disappearing Color Cake. When I first made this cake, I had visions of the rich red hibiscus imparting its taste, fragrance, and color — but alas, due to scientific machinations beyond my comprehension, the color did not oblige. Inexplicably, the moment I began drizzling the ruby red hibiscus liqueur over the pale yellow cake, the color simply disappeared, leaving in its wake taste, fragrance, but only the palest of pink coloring. Thankfully, the lack of hibiscus coloring does not detract from this otherwise scrumptious cake. The hibiscus used in tea and baking is not the flower of the plant, but rather the calyx, the red- or magenta-colored part of the plant that forms after the flower has died and fallen off. In Australia, hibiscus is called rosella and is a wildly popular hero of jams, syrups, liqueurs, and teas. It is also considered to be incredibly healthy for you as an anti-inflammatory, antioxidant, and promoter of low cholesterol, good blood circulation, and regulated blood pressure. Hibiscus is precious, indeed, for it is tedious work to remove the calyx from the bright green round seed pod. 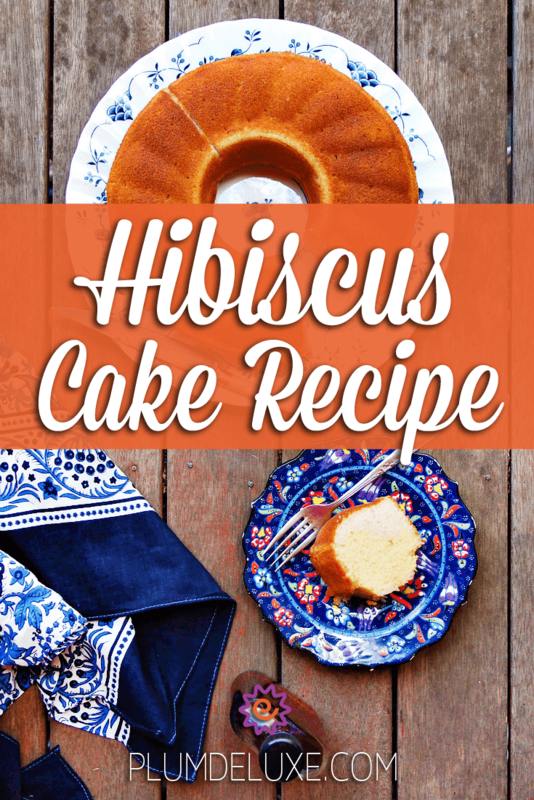 It is well worth the effort, though, as you’ll discover with one bite of this delicious hibiscus cake recipe. 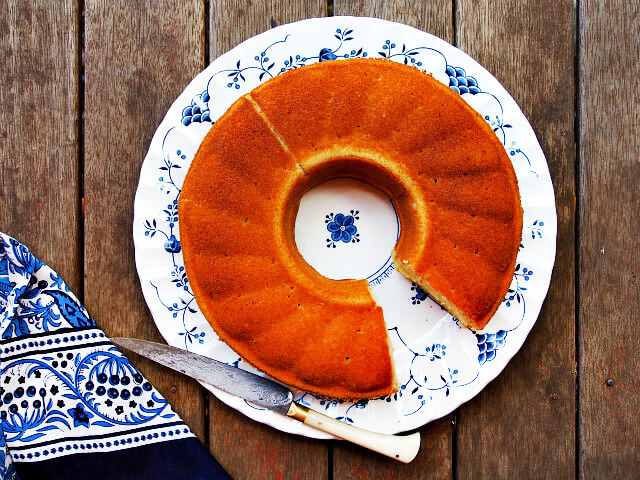 The cake used in this recipe is simplicity itself and doesn’t have a hint of hibiscus in it. That comes later. 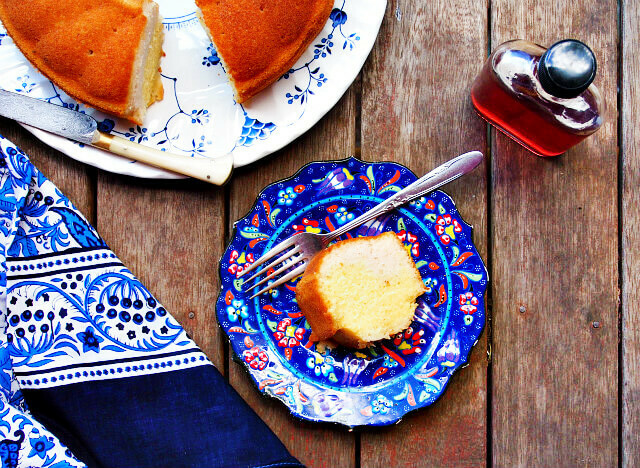 It is a lovely, buttery, moist cake flavored with rich vanilla. It keeps beautifully for several days and, as long as it’s covered, does not dry out. The hibiscus flavoring for the cake comes in the form of a luxurious hibiscus liqueur that is drizzled over the cake while it is still warm. It seeps down into the cake providing a luscious, warming hit of hibiscus with every bite. Hibiscus liqueur may seem hard to find, but you can easily make it in the comfort of your own kitchen thanks to our variety of hibiscus teas. You can keep it simple with our Just Hibiscus herbal tea, or add some additional layers of flavor with our Happy Hour herbal tea with hibiscus and lime or the Easy to Be Green tea with blueberry and hibiscus. We’ve used them in our Hibiscus Herbal Tea Smoothie, and they would be a beautiful substitute for the extract used in our Dark Chocolate Scone Cookies. 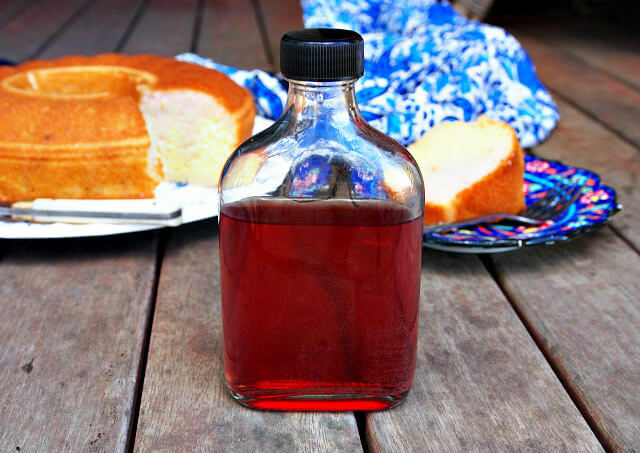 Hibiscus liqueur is easy to make. You only need the hibiscus tea of your choosing, vodka, white sugar, and water. That’s it! Simply place the hibiscus tea into a sterilized glass jar and pour in vodka until it’s covered by half an inch. Seal the jar and shake well to combine. Set into a dark place (a cupboard is great) and leave for two weeks. Check every few days to make sure the dried tea is still covered by half an inch of vodka. If the liquid reduces, just top up with more vodka. After two weeks, strain the liquid and return it to the jar. Stir in simple syrup (see recipe below) until it reaches the flavor you like. Seal and store until ready to use. Place hibiscus tea in sterilized glass jar. Cover with vodka, seal, and shake to combine. Shake once a day for 2 weeks. If vodka level lowers, add more to cover by 1/2 inch. After 2 weeks, strain through cheesecloth, squeezing to get all moisture out. Set aside. In small saucepan stir together white sugar and water and set over high heat. Bring to boil and stir until sugar dissolves completely. Remove from heat and cool to room temperature. When sugar syrup is cool, add hibiscus vodka, stir well, pour into sterilized glass jar, and seal until ready to use. After baking your cake, let it cool in the pan for about five minutes, then carefully remove it to a serving dish. 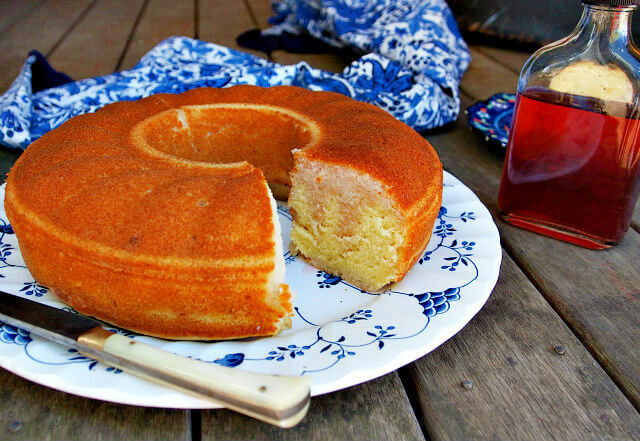 Using a matchstick, make holes over the top of the cake, then drizzle in the hibiscus liqueur. Leave a few minutes for the liqueur to soak in, then serve the cake warm or cold with a side of whipped cream. After the first day, we like to serve slices of cake spread with softened salted butter. In medium bowl, stir together flour, salt, baking powder, and baking soda. Set aside. In large bowl, beat together butter and sugar until light and fluffy, about 2-3 minutes. Add eggs one at a time, beating well between additions. Add vanilla and beat well. Add dry ingredients gradually to butter mixture, stirring well after each addition. Add buttermilk and whisk together well until smooth and no lumps remain. Pour into greased bundt or 9-inch cake pan. Bake for 20-25 minutes until toothpick inserted in center comes out clean. Remove to cooling rack and let sit for 5 minutes. Carefully remove cake from pan, turning out onto serving platter. With a matchstick, poke holes all over the top of the cake. Drizzle in about 1 cup of Hibiscus Liqueur. Let cool to room temperature and serve plain or with a side of whipped cream.